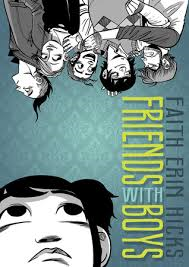 I didn’t know that the author and illustrator of the graphic novel Friends with Boys, Faith Erin Hicks, was from Halifax until I finished the book. I am not going to let the fact that we are practically neighbours (well, by Canadian standards we actually are!) influence my thoughts about Friends with Boys. …which overall I liked (although I am by no means an authority on graphic novels and have really only started to read them in any number since I started building my classroom library.) I did feel the novel missed some great opportunities and had some structural problems – but, yeah, liked it. Maggie’s three older brothers, twins Lloyd and Zander and Daniel have already made the transition to high school and as Daniel admits to Maggie, he likes being at school better than learning at home. Of course he’s been there a few years, and is well-known and liked. School isn’t the only thing complicating Maggie’s life – her mother has left home. Her father says “It’s exactly seventeen years since your mom started homeschooling you lot,” to which her brother Zander replies “Yeah and to celebrate she took off.” There is all sorts of unspoken angst in this situation, which is never satisfactorily dealt with. And she has a ghost. An actual ghost that she met when she was a kid and whom occasionally follows her around. We never quite find out what the deal is there, either. Then there’s Lucy and Alistair, the brother and sister who befriend Maggie. At least we learn why Alistair is a social piranha. That’s a lot of stuff on the plate of a fourteen-year-old and any of it would could have made a rich and compelling story on its own. I was intrigued by the ghost, loved Maggie’s older siblings and wondered what had happened to the mom. Ultimately, though, I felt like Hicks only scratched the surface of all these stories. This entry was posted in Uncategorized and tagged 2014, Book Review, Canadian, graphic novel, teen, YA by Christie. Bookmark the permalink.